More than 100 destinations for trout and bass across Georgia, North Carolina and Tennessee! Thousands of miles of scenic streams and rivers lace the southern reach of the Appalachian Mountains. Knowing which waters best suit you as a fly-fisherman -- novice, intermediate or expert -- and when, where and how to fish each is one of the biggest challenges you face. We can help you choose the trout streams and smallmouth bass streams best suited for your fly-fishing and wade-fishing skill set. Permitted by the US Forest Service and National Park Service to guide anglers on more than 100 streams across north Georgia, western North Carolina and southeast Tennessee, our guides can lead you to successful outings on year-round tailwaters, special-designation rivers and streams, stocked public waters and the wildest trout waters shadowed by the remote ridges of the southern Appalachian Mountains. 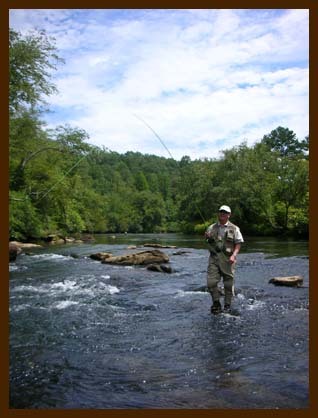 Using three public-access sites located on the Toccoa River downstream from Blue Ridge Dam, we show wade-fishermen how to tap into one of the finest stocked and wild trout waters of North Georgia. The Toccoa flows cold for 15 miles from beneath the dam at Lake Blue Ridge, supporting outstanding trout fishing on dry flies, nymphs and streamers. Spring and fall are the top periods, but summer anglers need not worry: The Toccoa River is a year-round fishery capable of producing good catches of rainbow and brown trout during even the hottest months. 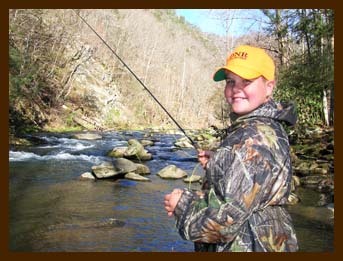 Dubbed by many fly-rodders as the premier fly-fishing destinations in the southern Appalachian Mountains, the Nantahala, Tuckaseegee, Toccoa, Tellico and Chattooga rivers hold every feature found on the trout streams of Georgia, North Carolina and Tennessee. During peak seasons (March through May) the "delayed harvest" sections of these rivers are packed with thousands of trout per mile among boulder runs, glassy pools, pocket water and drop pools. Enjoyed by beginner to expert fly-fishermen, these scenic riverways in North Carolina, Georgia and Tennessee hold brown, rainbow and brook trout , and are fished by the guides of Reel Angling Adventure from October 1 through June 1. Home to some of southeast Tennessee’s best fly-fishing and spin-fishing for trout and smallmouth bass (stripers, too, in season), the Hiwassee River at Reliance, TN, offers excellent wade-trips for the avid fisherman. It's strictly a catch-and-release adventure when you fly-fish or spin-fish the stunning Hiwassee River. Arguably the most beautiful riverway in the Southeast, the Hiwassee River is listed by Congress among the national scenic rivers. Up to 20 miles of riverway flows through high ridges, sheer bluffs and a pastoral valley where you're sure to find your angler's taste for action! Weather you are a novice or an experienced angler, the Hiwassee river provides you with opportunities to catch fish and challenge your abilities. When the power generators at Smith Creek Powerhouse are off, hundreds of pools, runs, lanes and holes are revealed where trout take flies, spinners and spoons. Up to 12 miles of river can be accessed on foot. 100 MORE STREAMS! 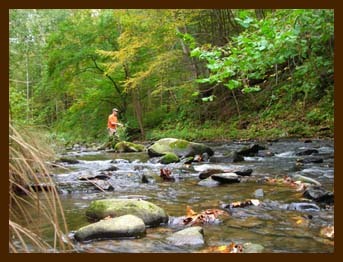 Reel Angling Adventures is permitted by the US Forest Service and the National Park Service to operate as a fly-fishing outfitter on hundreds of miles of trout streams across the southern Appalachian Mountains of Georgia, Tennessee and North Carolina. Take your pick for guided fly-fishing and spin-fishing from more guided fishing destinations than any other outfitter in the southern Appalachian Mountains: pristine wild trout streams, seasonally stocked waters and tailwater flows. Brown trout, rainbow trout , brook trout and smallmouth bass ... we'll show you how to find catch them all! NOTE: Most pricing for trips offered are based on one or two anglers per trip. Additional anglers can be accommodated on a per angler basis and may require additional guides/boats. Large parties can be accommodated with customized trip packages. Fishing accessories and initial fly selections (recommendations available) -- such as waders, wading boots, caps, sunscreen, insect repellent, etc. -- are not provided. Additional flies provided by guides at no cost. Fishing licenses are required for all waters and are the responsibility of each angler. Prices subject to change. Copyright© 2010 All Rights Reserved.